The first thing you do upon developing a flexible holographic smartphone display? Fire up a game of Angry Birds, naturally. All the rest of that smartphone functionality can wait until you’ve finished a few rounds of slingshotting avian missiles. Maybe it’s not the first thing — but it was clearly high on the list of the Human Media Lab researchers who developed the HoloFlex. And indeed, the game makes a pretty sizable cameo in the demo video for the new technology, which utilizes motion parallax and stereoscopy to render 3D images without the need for glasses. The technology is built into a Flexible Organic Light Emitting Diode (FOLED) touchscreen that can be bent by the user. In addition to the oft-stated upsides of a bendy smartphone, a built-in bend sensor (similar to what the lab deployed in its recent ReFlex prototype) leverages the motion as another means with which to interact with the handset. The pair of disembodied hands in the demo video use the motion to move objects along the phone’s Z-axis. 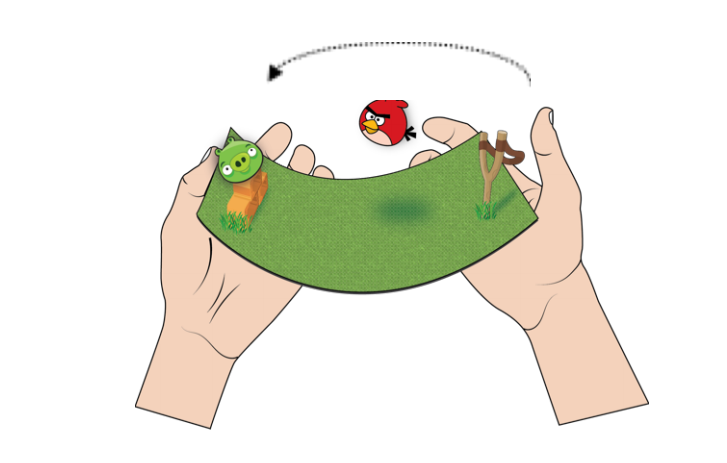 In the case of Angry Birds, that means stretching back the bird-catapulting slingshot. The tension on the phone correlates with that of the elastic band as it stretches back. As is pretty clear from the video, this is all still very much in its early stages. Most notably, there’s the extremely low-res 160 x 104 resolution (a result of dividing up the full HD display to achieve the desired 3D effect). But the lab has some grand plans, including holographic video conferences. “When bending the display, users literally pop out of the screen and can even look around at each other, with their faces rendered correctly from any angle to any onlooker,” researcher Dr. Roel Vertegaal says in a release announcing the new technology. The lab, naturally, references Princess Leia in the release to really drive the point home. Dr. Vertegaal, you’re our only hope. Internal specs, for those who care about such things on their display prototypes, include a 1.5 GHz processor and 2 GB RAM running Android 5.1. The technology will be on display at the ACM CHI 2016 conference in San Jose next week.